I am far from an expert on Malaysian cuisine but I enjoy it since I was a child in Hong Kong. A cosmopolitan city at heart, Malaysian restaurants are common and a popular choice for dining out in my family. After I moved to Toronto, I was disappointed that authentic Malaysian restaurants were few and far between. 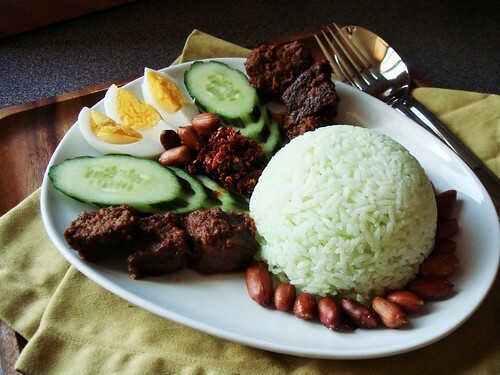 I missed my favourite dish nasi lemak dearly. 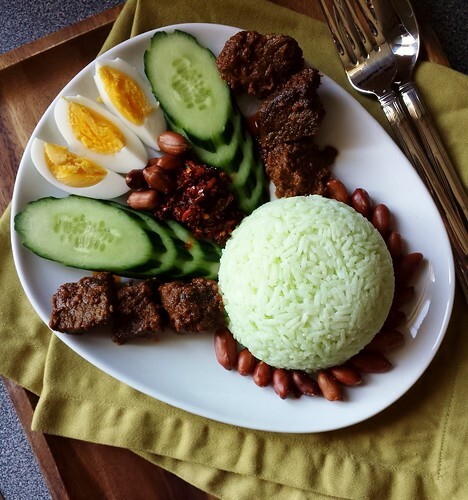 Lucky for me, it is not all that difficult to make nasi lemak at home. The comforting coconut steamed rice dish is often accompanied by an assortment of sides that complement and contrast. The spicy sambal with fiery chillies and crunchy anchovies is my favourite. The heat is tamed by cooling slices of cucumbers and rich coconut steamed rice fragrant with pandan. Wedges of hardboiled egg nudge the dish firmly in the breakfast territory. Crunchy salted peanuts keep up the textural interest. And don’t forget the meaty pieces of beef rendang! 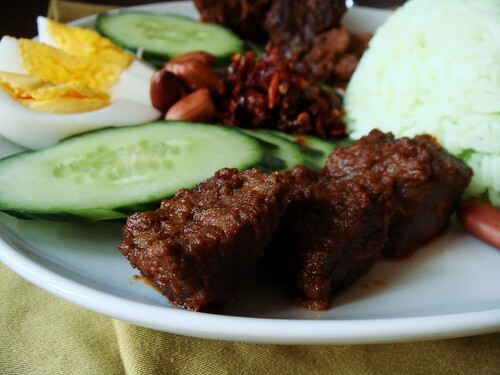 What is beef rendang you ask? This is a dry curry of beef braised in coconut milk until most of the liquid evaporates. What you’re left with is intensely flavourful pieces of meat infused with the complexity of curry. I am not ashamed to admit that I took a shortcut with the curry and used premade spice paste. After standing in front of the Malaysian aisle for 15 minutes carefully examining every variation of beef rendang spice paste available, I chose one with only recognizable ingredients that I would not hesitate to source myself. The package direction is simple. Saute spice paste until fragrant. Brown chunks of beef in spice paste. Simmer with coconut milk until semi-dry. The only glitch was that the suggested cooking time on the package is way off and I braised my beef rendang for close to 90 minutes. Wait, that was not the only glitch. Smart planner that I am, I bought three times as much beef as the spice paste should accommodate. Since it was too late for emergency grocery store trip, I rummaged in the fridge for solutions. Aha, a can of Thai red curry paste! The ingredient list looked remarkably similar to the rendang spice mix so I threw caution into the wind and supplemented with a healthy dose of red curry paste. Beef rendang freezes beautifully especially when I package portions in vacuum-sealed bags. This time I didn’t because my craving for nasi lemak did not want to wait. Breakfast for dinner is always awesome and it was made doubly special with this Malaysian specialty in the recent cold spell. It was a quick and easy dinner with all the components made ahead of time. These days, “quick and easy dinner” makes my ears perk up. 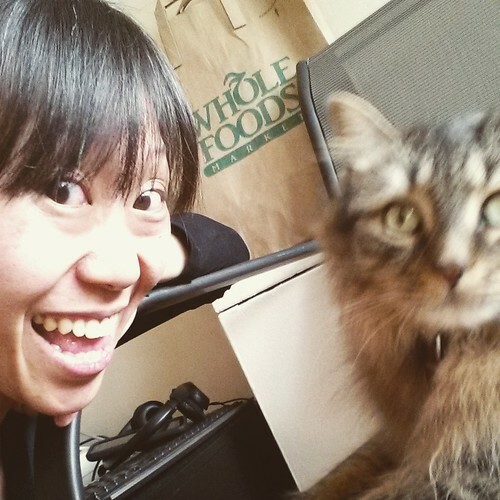 I am in a transition period of my career, left my life as computer programmer and embarking on a journey to become a small business owner. Since January, I’ve been working at Manic Coffee to learn the ins and outs of running a successful independent coffee shop. I’m adjusting to the different work hours in the food and beverage industry. Fitting my inline skating training program in my new schedule means occasionally I do not get home until well after 11pm….and totally ravenous. Any meals that I can get on the table quickly get special mention in my books. I will try to keep posting once a week here at Dessert By Candy. Since I do a lot of recipe development these days, you will find up-to-the-minute information on my Instagram feed. Of course, for those in the GTA, you can also come say hi at the coffee shop!